Negotiations on visa facilitation between the European Union and Azerbaijan are very close to completion, a senior EU official said on a visit to Baku Friday. "The agreement will allow Azerbaijani people to benefit from the procedures to travel to the EU," Stefan Fule, the EU's Commissioner for Enlargement and European Neighborhood Policy, said at a press conference. According to Fule, an aviation agreement is also on its way. "Hopefully, we can finalize it in the near future," he said. Azerbaijan and the EU launched official negotiations on visa facilitation in March 2012 in Baku. An agreement on the simplification of visa entry for citizens of Azerbaijan provides for a reduction of the list of documents submitted along with the visa application and the possibility of issuing multiple entry visas with a longer validity period, thus reducing the cost of visas or even making them free for particular categories, and envisions time limits for processing an application. The agreement on readmission will develop a mechanism for repatriation of those residing in the EU and Azerbaijan without permission. The EU and Azerbaijan are maintaining relations under the Partnership and Cooperation Agreement, which was signed in 1996 and came into force in 1999. In 2009, the EU passed a decision to sanction negotiations on the conclusion of bilateral association agreements of Azerbaijan, Georgia and Armenia with the organization. These agreements will be a new practical instrument to replace the bilateral action plans. Azerbaijan is also included in the EU's Eastern Partnership program, adopted at the initiative of Poland and Sweden and approved at the EU summit in Brussels in 2008. The Eastern Partnership is aimed at political and economic rapprochement of six post-Soviet states with the EU. Regarding presidential elections in Azerbaijan scheduled for the fall of 2013, Fule said that the elections will be a test for democracy. "We want to see them conducted in accordance with international commitments of the country. And we want them to be free and fair," he said. On the Armenia-Azerbaijan Nagorno-Karabakh conflict, the EU support is focused on the mediating OSCE Minsk Group and Madrid principles -- a peace outline proposed by the mediators. "The current status quo is unacceptable. We are the ones who proposed confidence building measures," he said. The Nagorno-Karabakh conflict emerged in 1988 when Armenia made territorial claims against the neighboring country. Since a lengthy war between the two South Caucasus countries that displaced over a million Azerbaijanis and ended with the signing of a precarious cease-fire in 1994, Armenian armed forces have occupied over 20 percent of Azerbaijan's internationally recognized territory, including the Nagorno-Karabakh region and seven surrounding districts. Peace talks brokered by OSCE Minsk Group co-chairs representing the United States, Russia and France have been largely fruitless so far. Speaking about EU-Azerbaijan relations at the Azerbaijan Diplomatic Academy in Baku on Friday, Fule noted that the EU appreciates Azerbaijan's close involvement in the Southern Gas Corridor project. "Energy cooperation has a strategic dimension. Energy diversification means a lot to us," he said. Fule emphasized that the Southern Gas Corridor will connect the Caspian region with the EU. "It is not important which pipeline will be selected, it is important that the project will be commercially viable, and it is important that it can transport not only Azerbaijani gas, but also gas from Turkmenistan," Fule said. The Southern Gas Corridor, which is one of the EU's priority energy projects, aims at diversifying the routes and sources of energy supply, thereby increasing secure delivery. Currently, the Shah Deniz consortium considers two options for its gas transportation to Europe - TAP and Nabucco West. The final decision on the pipeline route will be made in June 2013. According to Fule, the EU considers Azerbaijan as an interesting and reliable partner. The bloc deems it as a partner in areas including energy security, culture and education. 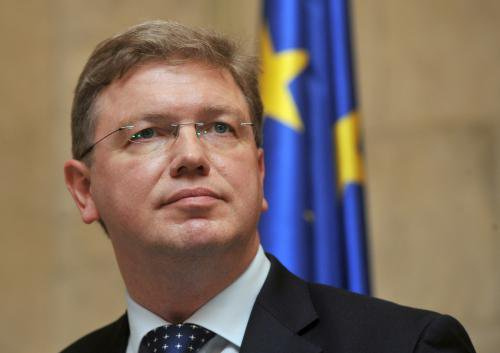 Fule said the EU is interested in deepening its relations with Azerbaijan. He stressed that the EU-Azerbaijan partnership has enormous potential and a solid foundation can be built for promoting prosperity. "The EU-Azerbaijan relations are developing through the Eastern Partnership. The Eastern Partnership will bring the relations to a new level. It will strengthen the links between Azerbaijani and European people," he said.